As stated many times previously, Rochesterians have an uncanny ability to underappreciate anything and everything that is in or near Rochester. Restaurants, parks, universities, museums...nothing is safe from the devaluing of all that is local. A perfect example is the Finger Lakes wine region. Mention of this wine region among the particularly pessimistic evokes unfavorable comparisons to California. The slightly less despondent might be willing to acknowledge the strength of local Rieslings, but always with the disclaimer that the red wines are undrinkable. Fortunately, entities with slightly more expertise are not as harsh on our local wine region. Last year, Wine Enthusiast revealed its 10 Best Wine Travel Destinations of 2015. Included were two destinations in France, one in Italy, one in New Zealand, one in Spain, and one in California. Also included were the Finger Lakes?! Isn't that between Rochester and Syracuse?! In describing the region, the magazine states that "increasingly, red varieties like Cabernet Franc, Pinot Noir and Syrah are stealing the spotlight." It appears that the cynics among us may have to look for new subject matter. Rochester and the Northeast in general place a premium on the maintenance of old buildings. Even when new buildings are built, they are made to fit the character of neighborhoods that are full of old buildings. This noble cause of preservation helps maintain a certain uniqueness in an era when much of America looks remarkably the same. Unfortunately, a fine line exists between preservation and obstruction. A look around the country suggests that Americans are not nearly as interested in architecture as some would maintain. As an example, Raleigh, North Carolina, one of the fastest growing metro areas in the country, is full of developments that might horrify Northeasterners. Yet the area continues to be a magnet for...Northeasterners. If private money can pursue a new venture by reusing an old building, all parties can be content. If private money can pursue a new venture that mandates the demolition or alteration of an abandoned structure, obstructionism to the point of derailing the development and preserving the abandoned structure is puzzling. In 1959, Research Triangle Park opened in the Raleigh-Durham-Chapel Hill region of North Carolina. Preceding the presence of this park, North Carolina's economy was sluggish at best, characterized by low-wage jobs in furniture and textile manufacturing along with an inability to retain talent produced by area universities. In an absolutely visionary move, governmental entities worked with three key universities to create an environment enticing to private sector research companies. These companies which would be lured to the region could then feed off the intellectual assets produced by higher education, creating a model for what would eventually become a knowledge-based economy. The result today is one of America's fastest growing metropolitan areas. As an example, the population of the city of Raleigh has increased from 65,679 in 1950 to 439,896 in 2014. Five years of slow growth which seemed to diminish the credibility of the park. Contrary to the beliefs of some grumpy Rochesterians, government, universities, and the private sector can work together to boost a regional economy. 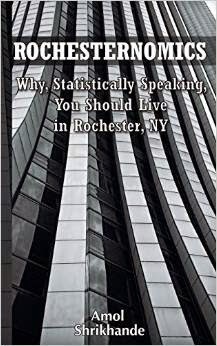 Rochester's reputational shortcomings can and should be overcome. The University of Rochester and the Rochester Institute of Technology are world-class universities that can easily produce the knowledge and expertise necessary for the future of this venture. Expecting tangible results in six months, one year, or even three years is ludicrous. If the photonics initiative has even a tiny fragment of the success of Research Triangle Park, that might be enough to fully rejuvenate Rochester. Since the project includes two key local universities (as opposed to three), the word triangle cannot be used. That said, I think we can all be happy with a line. A large amount of emphasis has been placed in recent years on reversing decades of catering to the automobile. The focus has shifted instead to the simple act of walking. Although this change in culture does not correlate with economic vibrancy (economically vibrant cities in Texas are not generally known for walkability), the cultural transformation does tend to create cities that feel more vibrant. As previously seen, Rochester is doing reasonably well in this regard. Walk Score identified Rochester as the 22nd most walkable city among 108 cities with populations over 200,000. Among mid-sized cities (those with populations between 200,000 and 300,000), Rochester was the 6th most walkable. It has also been recognized as one of the most affordable walkable cities.